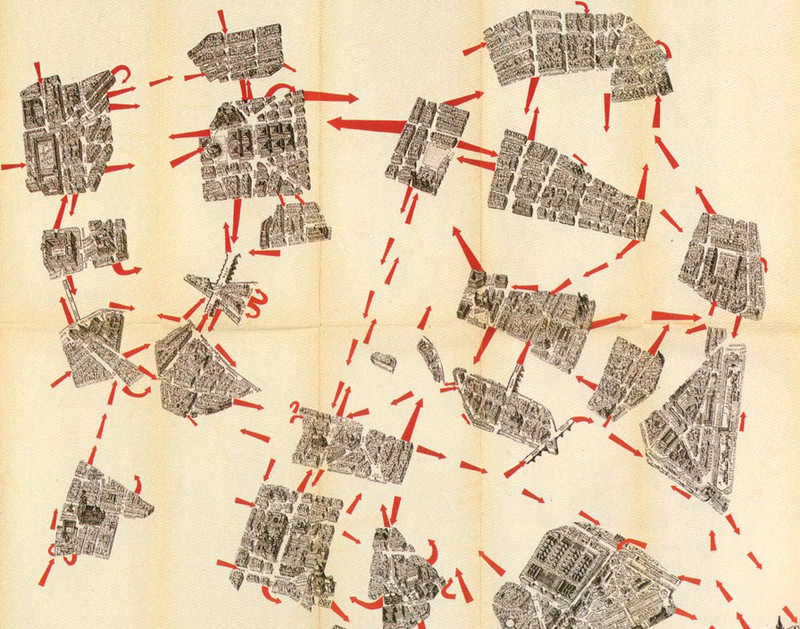 The piece’s title references an illustration by Guy Debord that maps, in his words, the “atmospheric unities of a city.” A city map is cut into regions experienced as having distinct unities. The “mentally experienced” distance between these areas is visualized by spreading out the pieces of the map, with directional arrows drawn between that illustrate the most active circulations of foot traffic. All other space between is left out so as to isolate only these features. With remarkable economy, the image portrays a web of social conditions that figure into the identities of most cities. Though providing less of a strict influence, this image and its related ideas worked strongly as a backdrop through which the piece developed.